If you are using the master key, make sure it is fully extended. When you lock the driver’s door with a key, all the other doors, trunk, and fuel fill door lock at the same time. 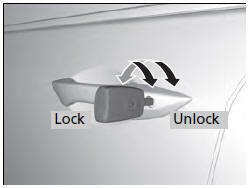 When unlocking, the driver’s door and fuel fill door unlock first. Turn the key a second time within a few seconds to unlock the remaining doors and the trunk.